Lincoln boss Danny Cowley delighted to sign Cian Bolger from Fleetwood for "free"
Lincoln City boss Danny Cowley says the League Two club has not paid a penny for Fleetwood Town centre-half Cian Bolger. The Gazette reported on Tuesday that the defender was in advanced transfer talks with the Red Imps and the two-and-a-half-year deal was confirmed on Friday. Bolger, 26, would have been out of contract at Highbury in the summer. 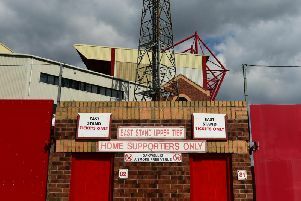 The Irishman, who joined Fleetwood on a free transfer from Southend United in the summer of 2016, was offered a new Town contract last summer but turned it down. He had been a first-team regular under both Uwe Rosler and John Sheridan but has fallen out of favour since the arrival of head coach Joey Barton last summer. He was Town’s player of the year for 2016/17, when they reached the play-offs, and made a total of 121 appearances for the club, scoring 13 goals. Scottish club Hibernian reportedly offered a six-figure sum and Championship club Hull City were also rumoured to be circling. Bolger said he had offers from a higher level but was excited by the Lincoln project. And the Imps boss spoke about his shock at Bolger’s availability. He added: “I’m delighted to have him with us. He’s done fantastically well at Fleetwood. He was one of the best centre-halves in League One last season.